Training, courses, sessions and toolbox talks. To book, it is best to phone Melbourne 03 9812 3322. There are a lot of people claiming to be experts on snakes these days and a number of providers of reptile awareness training sessions. However there is only one internationally regarded Authority on snakes who does snake awareness sessions in Australia. This is the snake man Ray Hoser. 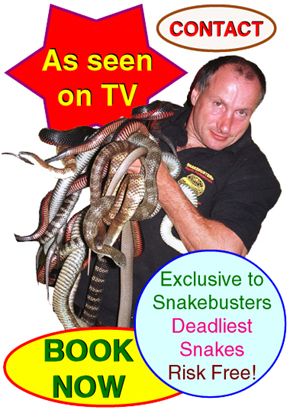 His company, Snakebusters are the only company with more than 30 years in the reptile education business and with an unmatched perfect safety record. Ray Hoser is the man who wrote the book on Australian snakes (published in 1989), authored 8 others as well as hundreds of major scientific papers on snakes and who has discovered and named more species of snake than anyone else on the planet! So it makes sense to get things right and be taught by the teacher of teachers. To verify this, just pick up almost any major book on snakes published anywhere in the world in the period post-dating year 1990 and you will see the Hoser name cited as an authority throughout. 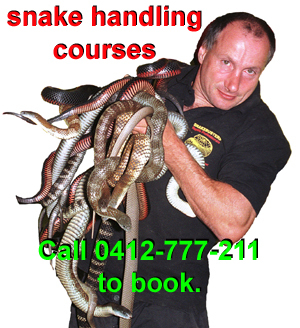 No other provider of reptile awareness sessions, snake courses and the like in Australia can make such a claim. The Snakebusters snake awareness sessions, snake handler courses and toolbox sessions are tailored to meet the needs of clients and quoted on a job-by-job basis. Having conducted scientific fieldwork across Australia and around the globe, it makes sense to get the expert in the first time to give your staff accurate information that may well save lives. Mistakes with snakes are not just costly, but they can be fatal as well. Snakebusters are also the only legal venomous snake displays in many parts of Australia, because only Snakebusters have the expertise to have surgically devenomized snakes, to remove all risks at displays. A reptile awareness session without the venomous snakes is only half a session and why wouldn’t people prefer to go with the leaders in the field who not only have more expertise than anyone else, but who can also bring to your venue the world’s five deadliest kinds of snake and in total safety! Toolbox talks and reptile awareness sessions typically last about 30-90 minutes and include vital information on snakes, snake behaviour, safety, avoiding bites, treating bites, legal obligations and more. They can be done at any time of day and at any venue. Snakebusters also do snake relocation training, snake control, emergency snake removals, work as a paid snake catcher, mine works, scientific surveys, snake prevention, site inspections and snake handling courses. As a business owner or manager it is essential you protect your staff as best you can and in the case of Snakebusters it costs no more to give your people the best. Remember, Snakebusters were given the legally enforceable registered trademark, Australia’s best reptiles, because they were measurably better than all other providers. Yes, Snakebusters have been given the legally enforceable exclusive right to claim they are the best at what they do, a position not given to any other business in Australia. For further information on Australia’s best reptiles awareness sessions, courses and training, it is best to phone Melbourne 03 9812 3322. PS If you see any other reptile course providers claiming in any way to be the best, let us know and we'll stop them! We don't want people to be misled with inferior and potentially dangerous information. Copyright 2015, Snakeman, All rights reserved.